Ms. Betty Barr has lived, as she likes to say, "50 of my 84 years" in Shanghai. She's got stories. We asked her how many of her old haunts remain. Quite a few, it turns out. 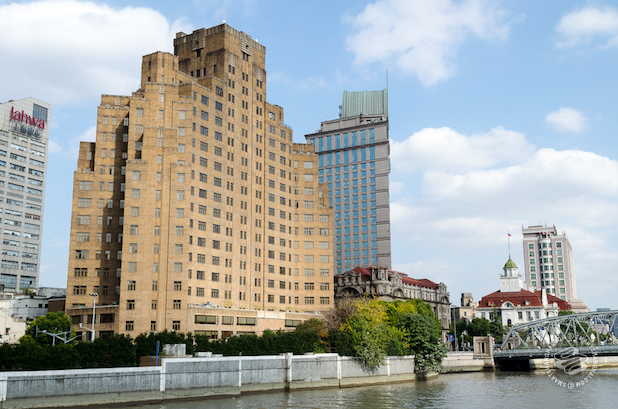 Ms. Betty Barr's tenure in Shanghai beats just about every other expat's by several decades. 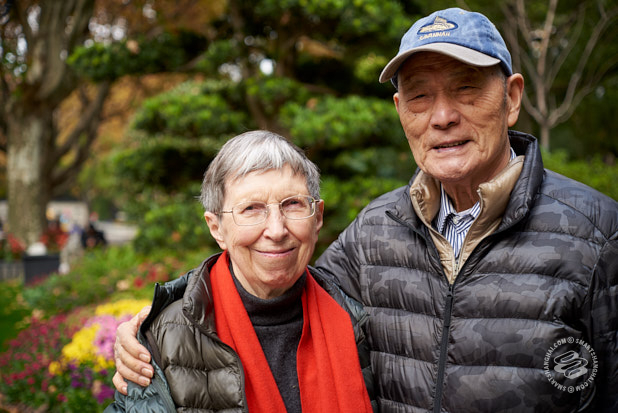 Born to a Scottish missionary father and an American mother in Shanghai in 1933, she's now a retired teacher and author of several books about the life she, her family and her husband, George Wang, have lived here. It's a life worth reading about, and she's seen a lot of the city come and go. We caught up with her to ask about the homes, streets, schools and churches that were her stomping grounds from her nipper days until 1950, then during her return during the Cultural Revolution from 1973-75, and after her most recent homecoming in 1984. More specifically, we wanted to know which ones are still around. The physical city through the eyes of someone who's grown up with it. 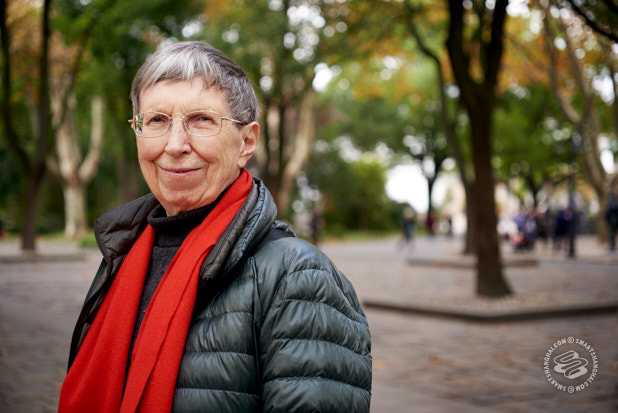 As she says, "I'm not an architect, nor am I an urban planner, I'm just somebody who has lived in this city for, as I often say, more than 50 of my 84 years." "We lived on Yuyuan Road for a while, which really hasn't changed much since those days. I remember the road was paved even then, and there were trams and buses and cars and rickshaws and pedicabs and carts and bicycles. Cacophony! More of a cacophony than now, if you can imagine." 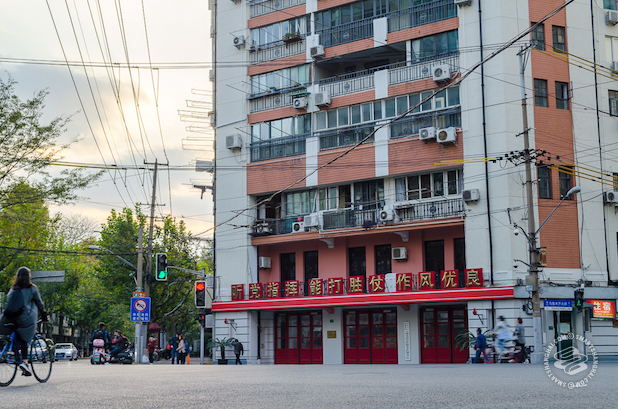 The firestation on the corner of Yuyuan Lu and Wulumuqi Bei Lu, still the headquarters and dormitory of the Jing'an Fire Department. "Being a missionary family, we didn't own a car. We went by bus or train, or rickshaw. Some of my more wealthy friends had their own private rickshaws. But even for a missionary family, my parents did a lot of socializing. They played bridge, endlessly, and they went to the movies. That seemed to be the main source of entertainment. My mother writes about going to sit in the gardens of some of her friends. The other places that I remember very much are the primary school and the fire station [on Yuyuan Lu]. The firestation is one of the landmarks of my childhood." Betty mused that she thinks the building might be sinking. That, or the pavement's been built up; the doors are all at least half a meter below the surface of the road. "Next to the fire station there were the Public School for Boys and the Public School for Girls, which were run by the Shanghai Municipal Council for "poor" families like us. The rich British went to the British School and the rich Americans went to the American School. And I went to the Public School for Girls. 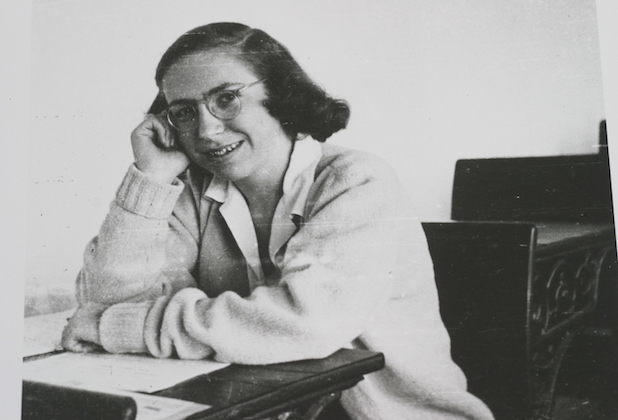 In a way it was kind of a normal life, I think... except that, as my husband would say, we had three servants." 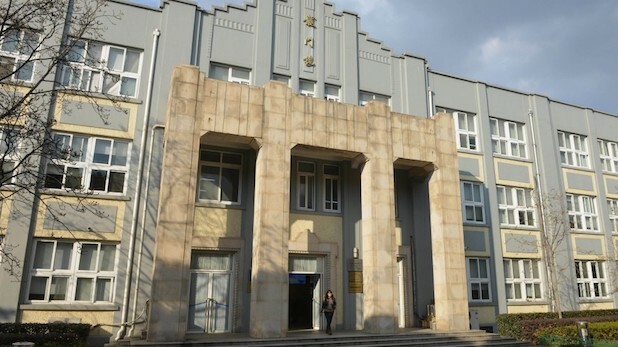 Betty's old primary school is now the Shixi Middle School. "I remember that as soon as the Japanese entered the International Settlement on Pearl Harbor day, I think from that day on, there was no more imported food. My father was Scottish, he liked having a kippered herring, so there was no more of that. 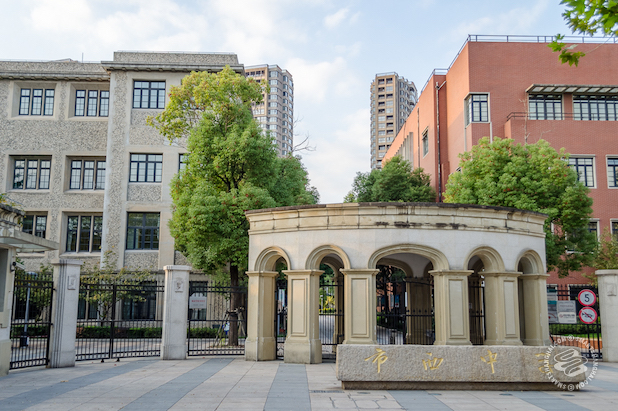 Since Yuyuan Lu was outside the International Settlement, it was considered unsafe, so on December 31, 1941 we moved to another house belonging to the mission, on Bubbling Well Road (now Nanjing Xi Lu). "It's at Lane 1522, these rows of little yellow houses, you can still find it. I can remember clearly moving from there by pedicab to the assembly point for the trip to the internment camp. That was in April, 1943, two days after my 10th birthday." The relatively modest housing compound Betty lived in. Betty's family would visit with friends who lived in "garden houses," built for wealthier residents of Shanghai. You can still find those all over Xuhui. "The camp was like a small town, where the Shanghai High School is now. It was a big campus, and the Japanese put barbed wire around it. I think when people hear the word camp, especially when they put the word "concentration" in front, they get this image of... It wasn't as bad as that. We were out in the countryside, surrounded by malarial mosquitos and without much food, but we still went to school. I was aged 10 to 12 and... well, we survived." "I remember when the American soldiers came. My mother, one of the few American women there, was asked to provide tiffin ("lunch"), and I was very proud. My mother and I went straight from the camp to a hospital ship heading to the United States. After a month's journey stopping at Okinawa, Guam and Pearl Harbour itself, we made it to Dallas, Texas, where I spent a year in a high school. 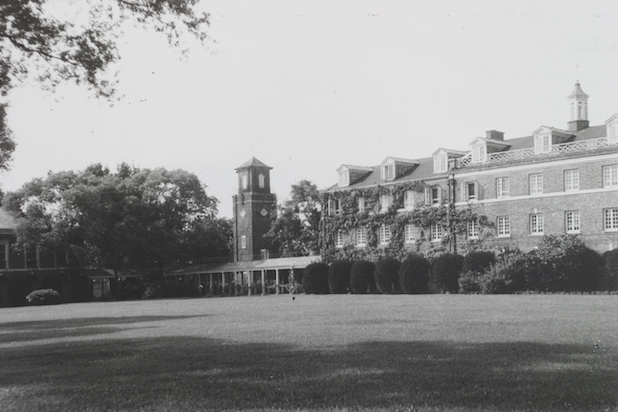 At the end of that freshman year, the missionary society wanted me to go to boarding school in Britain. But my American mother, a feisty Texan, she said no. "She's already a crazy mixed up kid, one year in a Dallas highschool, I want to take her back to Shanghai to the Shanghai American School. And I'm so glad my parents did." 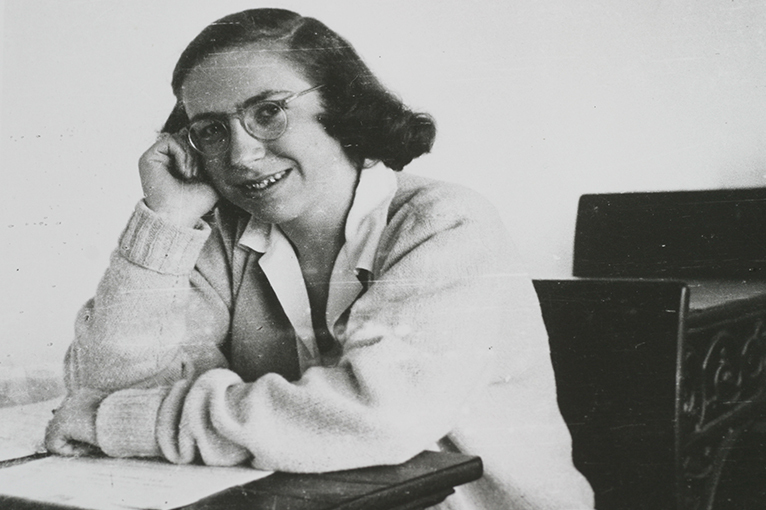 Betty Barr during her high school days at Shanghai American School, which recently celebrated it's 105th birthday. Their former campus is at 10 Hengshan Lu, now occupied by the China Shipbuilding Industry Corporation and not open to the public. "At SAS, we were very much like a family, especially those of us who boarded. Most of the boarders' parents were missionaries all over China. I played hockey, sports, I played the piano, which I learned from a descendant of the famous Dent merchant family. 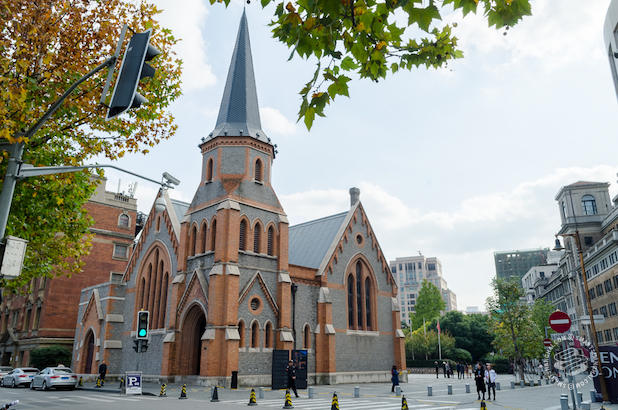 We'd cross the road to Community Church on Avenue Petain (now Hengshan Lu) for services. At the same time, in the last year, we were old enough to realize there were things happening in Shanghai." 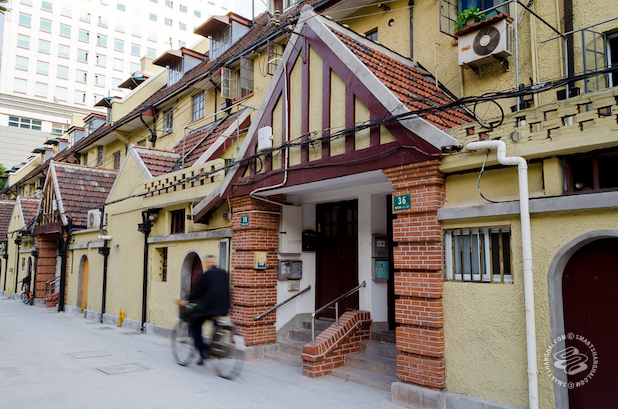 Now known as Hengshan Community Church, this cozy little spot is also where Betty's parents were married. "At various points during 1948-1949, there were departures. Only 11 of us graduated, where 50 had started out. I think my family stayed for the same reason they stayed in 1941-1945. I don't want to be idealistic, but I think my father wanted to be with his Chinese colleagues, and so, in the wartime, when many families left, my parents must have discussed it among themselves and they did not want the family separated. We took our final exams the day that the PLA marched into Shanghai. We looked out and we saw one lone sentry at the gate. I remember I called my parents and told them "We've been liberated!" The PLA hadn't reached my parents in Hongkou yet, so they responded "We haven't!" We graduated a few days later. The first time my parents left their house after liberation was to come to my graduation. I spent a year in Shanghai after that, learning to play the piano and the pipe organ, until 1950, when I left to study in America." "I was in Hong Kong at the time  and I heard teachers of English were being invited to the Mainland. So I quickly got my TEFL at the Institute of Education in London, went to the Chinese embassy in London, and asked if I could go. They invited me to Shanghai! I flew into Beijing on Pakistan Airlines in 1973, and then to Shanghai for a two-year contract at what was then called Shanghai Foreign Languages Institute. It's now Shanghai International Studies University." 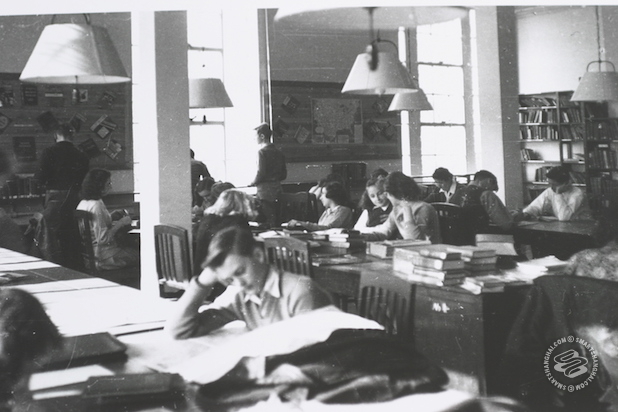 SISU traces its origin to the Shanghai Russian School, established in 1949 on Baoshan Lu. 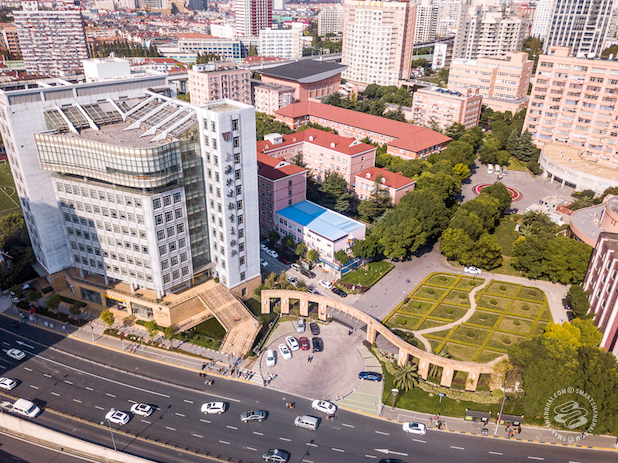 Betty finally retired from teaching at SISU in 2002, but still lives across the street from the school's Hongkou campus, pictured above, which dates from the 1950s. Read more about SISU's history here. "The big problem was that politics came first at that time, and it was difficult to find a text that was following the correct line. Fortunately, someone who worked in the city lent me some articles by Harrison Salisbury of the New York Times. He'd come to China in the "early days," as they say now, and written some articles which were... let's say "well-received". My students, all teachers who hadn't used their English in 8 years, were thrilled because they hadn't seen English written by a native speaker for a long time. There was very little physical change in Shanghai. 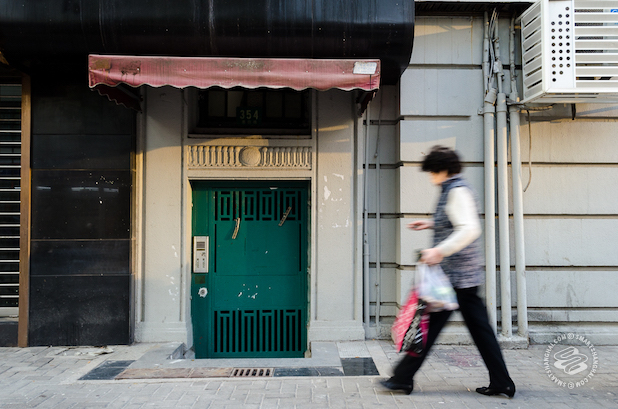 The places that people who live in Shanghai know, they were all still there. I could go around to all the places I remembered. 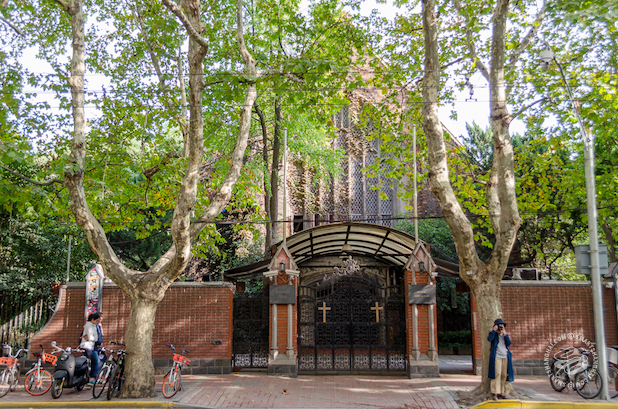 The church on Yuanmingyuan Lu where I had played the organ, which was shut then, and Nanjing Lu and the Old City." The Former Union Church, housed factory offices after 1949, minus its steeple. It was restored in 2010. "I lived in Shanghai Mansions because the Institute hadn't built a foreign experts' building yet. I was on the 14th floor, I remember there were a Japanese family, a French family, a German couple, a Peruvian couple... We were very much on our own, because there were no places to go. There were a few shops where we could exchange our "Foreign Exchange Currency," which we called "funny money" for some imported goods, and I think there was one western restaurant, called the Red House (which has since moved)." Shanghai Mansions, completed in 1934, has had many names but is now officially Broadway Mansions. Just before Betty moved in, it was called the Anti-Imperialism Building. It's currently a hotel. "I came back because Shanghai was my home. I wanted to help China, perhaps like my father, because I admired my father. But it was a two-year contract with the Chinese embassy, and then it was done. I think it was enough for me, too, at the time." "In 1984, I received a marriage proposal from my now-husband in the mail. In those days, it took 20 days to answer a letter. I didn't want him to wait a minute longer, so I sent my answer by telegram. Luckily, the British Council was just beginning to start English teaching projects in China. I was living in Scotland at the time, so I went overnight by train to be interviewed in London. The people laughed. They said, we usually ask people why they're going to China, but we won't ask you. They'd heard about my engagement. By the early 90s, everything was being torn up. But I've been living in the same flat on Dalian Xi Lu with George since 1984, so some things don't change. The same with Lu Xun Park, which is five minutes walk from our house. We love it. There's one section reserved for a Korean hero, who assassinated a Japanese general. It's cordoned off, so it's quieter. Since I'm over 70, I only have to pay 1 kuai to get in. The park was closed for a year for renovation about 5 years ago, and it's much improved." 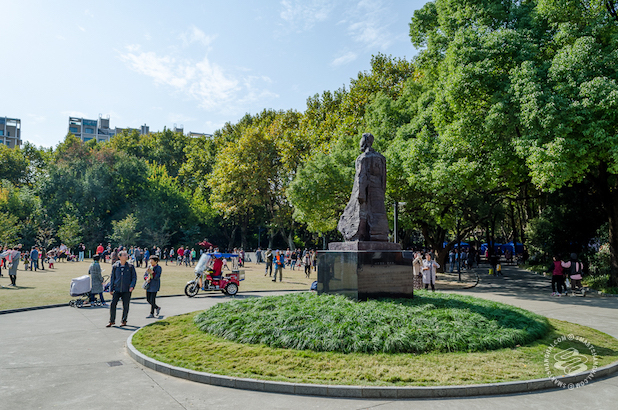 Lu Xun Park, named after one of China's most famous writers. Very popular on weekends, especially among the older generation, who chat, sing and play instruments (or cards) together. "Both George and I get annoyed with Westerners who talk about everything being destroyed, because a lot of things are left, including several of my houses. Yuyuan Lu, Bubbling Well Road, Hongkou, even the Camp is still there! I think Shanghai has done better than Hong Kong or Singapore with retaining its historical locations. I can remember in my childhood seeing dead bodies on the road. A lot of beggars. A lot of poverty. The biggest change I've seen is the change in the living standard, it's what impresses me the most. In that time, they've torn down the house where I lived when I was a teenager. I don't mind. It's not sacrosanct. If you want development (and you do), if a few buildings have to be torn down to improve the standards of living, tear them down." Enjoyed Berry Barr's narrative. I came to China in 1983 and 1984. I witnessed the youth all dressed in the kaki shirt and pants with the Mao hat bearing the red star. I witnessed the lines at the bread shops and the meat shops. When I returned in 2016 to court my beloved in Shanghai, I witnessed the great leap forward! Yowzer! My published narrative can be found under my name "Aaron Milavec." Great article about a great person. I was studying at SISU last year, and Betty came to give us a lecture during one of our classes, which felt pretty exceptional. Terrific work from the SmSh team as always ! This is special --- please more articles like this; not necessarily same content but quality and not about latest restaurant or bar.